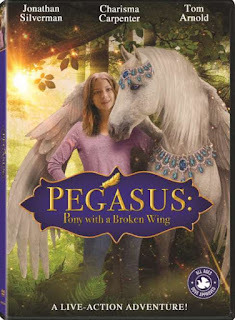 Pegasus: Pony with a Broken Wing arrives on DVD, Digital, and On Demand January 8 from Lionsgate. Awarded the Dove Seal of Approval for all ages, this live-action adventure stars Jonathan Silverman, Charisma Carpenter, and Tom Arnold. Pegasus: Pony with a Broken Wing will be available on DVD for the suggested retail price of $14.98. It's a wonderful family film that touches on the dreams of every young girl. Pegasus: Pony with a Broken Wing shows us miracles can happen. Just ask the Killian's?It’ll take a miracle to save the Killian family’s ranch but miracles come in all shapes and sizes. Just as a greedy developer (Tom Arnold) plans to take over their ranch, tween girl Sydney Killian and a neighbor boy ﬁnd a mysterious pony with an injured wing. As they secretly heal the creature, they ﬁnd the pony’s magical powers could change their fortunes forever. This charming family adventure also stars Charisma Carpenter (The Expendables franchise) and Jonathan Silverman (Weekend at Bernie’s). What little girl doesn't love ponies, magic, miracles and glitz. Pegasus: Pony with a Broken Wing includes all those things and so much more. Great for any ages as it recieved the Dove Award. It is the perfect movie for a pre-teen to tween girl in my opinion but my four year old set still and watched it all with me to. It is full of actioin, magic and adventure. It's a fun watch with the kids for adults as well.